This Persistence Market Research (PMR) report features the ‘Global Wireless fetal monitoring systems Market’ for the period 2018–2026 The report objective is to offer updates on the ongoing market trends and information regarding market opportunities in the global wireless fetal monitoring systems market. This Persistence Market Research (PMR) report examines the wireless fetal monitoring systems market for the period 2018–2026. The primary objective of the report is to offer insights into developments in the wireless fetal monitoring systems market that are significantly transforming global businesses and enterprises. Growth of the global wireless fetal monitoring system is primarily driven by increasing awareness among the pregnant women. Manufacturers are increasing their Market Share by Offering Products at Low Cost, Awareness Program for High BMI Pregnant women, Growing Demand for Real Time Monitoring, Technological Advancement and others. However, high cost of wireless fetal monitoring systems, substandard quality of products and others some factors expected to hamper the growth of the global wireless fetal monitoring system over the forecast period. This report uncovers the global wireless fetal monitoring systems market performance concerning revenue contribution from various segments. This section also comprises of PMR analysis of key trends, drivers, challenges, and opportunities, which are influencing the growth of the global wireless fetal monitoring systems market. Impact analysis of the key growth drivers and restraints are included in this report to better provide clients with decision-making insights. The wireless fetal monitoring systems market report provides an overview of the market. This section also underlines factors influencing the growth of wireless fetal monitoring systems market along with detailing of the key trends, drivers, challenges, and opportunities. Impact analysis of the trends is included in the report to better clients with information and insights. Distinguishing features of the report includes a list of major vendors manufacturing workstations, drivers, and restraints regional impact analysis, and competitive dashboard. Furthermore, PMR provides a competitive landscape to the companies and their strategic developments. Instruments segment dominates the overall market for wireless fetal monitoring systems market and is expected grow in high rate. The economically developing country such as Asia-Pacific are expected to create opportunity for the wireless fetal monitoring systems market in the forecast period. Also, we have considered the year-on-year growth to understand the predictability of the market and to identify the right growth opportunities in the global wireless fetal monitoring systems market. An analysis of absolute dollar opportunity and incremental opportunity is conducted for primary segments of this report. Absolute dollar opportunity is usually overlooked while forecasting the market. However, it is the most critical factor for analysing the level of opportunities that a manufacturer can look to achieve, as well as to identify potential resources from a sales and delivery perspective. In the final section of the wireless fetal monitoring systems market report, ‘Competitive Landscape' section is included to provide a detailed analysis with a dashboard view, to access the key differentiators among the competitor firms. Detailed profiles of major manufacturing companies is included with company-specific long-term and short-term strategies, company profiles are equipped with their product offerings and recent developments in the Wireless fetal monitoring systems market. Key companies covered in the report are General Electric Company, Koninklijke Philips N.V., OBMedical Company, Huntleigh Healthcare Limited (ARJO Family), Sunray Medical Apparatus Co., Ltd., Dixion Vertrieb der Medizingeräte GmbH, Shenzhen Unicare Electronic Co., Ltd.,Shenzhen Jumper Medical Equipment Co.,Ltd., Shenzhen Aeon Technology Co., Ltd., Shenzhen Lai Kang Ning Medical Technology Co., Ltd., Mediana Co., Ltd.
Wireless fetal heart monitoring system is an innovative system that can monitor the heart rate and movement of the fetal and help reduce the risk of fetal deaths and major health issue in pregnancy. The wireless fetal monitoring system play an important role in preventing the heart failure of the fetal and saving the life of both mother and fetal. Wireless fetal heart monitoring system also provides freedom of movement to the mothers and can be operated from long distances due to the Bluetooth technology. The fetal monitoring system becomes an integral part of inpatient labor care unit in US as well as in other countries. Wireless fetal monitoring system manufacturers are focusing on promotional activities to create awareness among patients about the advantages of monitoring the fetal during pregnancy, especially for high BMI women. They are also conducting training programs for gynaecologist to enhance their skills for monitoring the fetal heart rate, which in turn is expected to drive the market for wireless fetal monitoring systems. For instance, some companies that provide training for wireless fetal monitoring systems include Monica Healthcare (sub. of General Electric Company), and OBMedical Company, among others. The healthcare industry is growing at faster rate as the number of patients is increasing across the globe. Likewise, new transducers are available in the market that wire free and are capable of measuring the heart rate as well as the movement of the fetal. The new wireless fetal monitoring system is capable of measuring uterine activity, maternal pulse, maternal ECG, fetal ECG, and intrauterine pressure (IUP). Also, the Bluetooth technology in the system helps to connect it at longer distance, and allows the mother move and simultaneously delivers accurate output. The global wireless fetal monitoring system estimated to be worth US$ 1,242.2 Mn by 2018 end and is expected to expand at a CAGR of 6.8% over the forecast period of 2018–2026. North America accounted for largest market share and was valued at US$ 438.4 Mn in 2018, and is expected to expand at a CAGR of 6.4% over the forecast period. Instruments segment hold a significant share of around 66.2% in 2018 and is expected to dominate throughout the forecast period, registering higher CAGR as compared to other segments. Fetal heart rate monitoring system hold a significant share of around 72.0% in 2018 and is expected to dominate throughout the forecast period, registering higher CAGR as compared to other segments. Hospitals end user segment hold a significant share of around 54.8% in 2018 and is expected to dominate throughout the forecast period, registering higher CAGR as compared to other segments. Geographically, North America is expected to be the dominant regional market by 2018 end and is expected to expand at a CAGR of 6.4% over the forecast period. 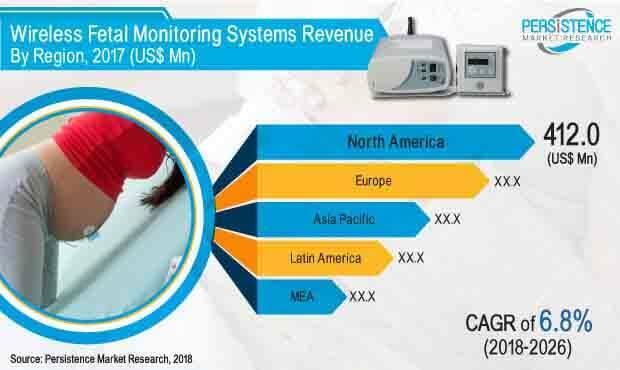 Asia-Pacific is expected to be the fastest growing market in terms of revenue growth in the global wireless fetal monitoring systems, registering a CAGR of 7.3% over the forecast period. Some key players in the global wireless fetal monitoring system included in this report are General Electric Company, Koninklijke Philips N.V., OBMedical Company, Huntleigh Healthcare Limited (ARJO Family), Sunray Medical Apparatus Co., Ltd., Dixion Vertrieb der Medizingeräte GmbH, Shenzhen Unicare Electronic Co., Ltd.,Shenzhen Jumper Medical Equipment Co.,Ltd., Shenzhen Aeon Technology Co., Ltd., Shenzhen Lai Kang Ning Medical Technology Co., Ltd., Mediana Co., Ltd.
Shenzhen Lai Kang Ning Medical Technology Co., Ltd.